A burst of spring sunshine, Sunny Heather will bring light and freshness to any room it sits in. 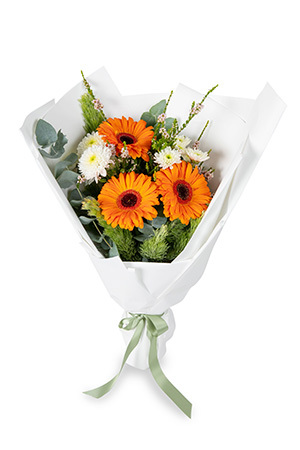 This value arrangement is perfect for all occasions, with its mix of bursting Gerberas, Chrysanthemums and local flowers.Vase not included however, we suggest including a Standard Vase with your gift to add a special touch to Sunny Heather. Flowers were delivered as per instructions which was great, however i should have got them given to the management of the premises because my Sister didnt get home until after looking a after her grandchildren around 5pm and the flowers were sitting out for awhile, so next time i will have to make better delivery arrangements thankyou. Easy online ordering and good to be able to track delivery. My sister said the flowers were beautiful. However no online acknowledgement that they had arrived which I know is dependent on the supplier notifying your company but would have been reassuring. However, soon got the text from my sister to confirm they had arrived! Thanks. I am so pleased so have found a great service. My Mum is unwell and she loves flowers. Living the other side of the world makes it difficult to send flowers at a reasonable cost, prices are good. Thanks. I am very happy with the service and quality. I order flowers for staff and also personally. I always recomend your webisite! I HAD NOT FILLED SOME OF THE DELIVERY DETAILS IN ON LINE, BUT WITHIN TEN MINUTES ONE OF YOUR GUYS CONTACTED ME FOR THESE. I WAS SO PLEASED WITH THE SERVICE FROM THE START TO THE END. IT WAS MY DAUGHTERS FIRST BIRTHDAY LIVING IN AUSTRALIA, SO I DIDNT WANT ANYTHING TO GO WRONG SO YOU DONE ME PROUD, THANK YOU. my flower order was delivered when I wanted it to be. Thank you.